There’s something fishy about the sign of Jonah. When Yeshua uttered the words He spoke about the only sign an evil and adulterous generation would be given to prove His legitimacy as the Messiah, He dangled a Hebraic hook before them. We may not know who took the bait on that Biblical barb, but it is safe to say that someone surely did, for the catch has only increased as the centuries have gone by. The lure He used was a reference to one of Scripture’s most astonishing of books – the book of Jonah. The book of Jonah is popular for its appeal towards children, and yet, it is actually one of the darkest, most troubling of Spirit-inspired books in regards to subject matter. The book is arguably one of the most misunderstood stories in all of the Word, and thus worthy of our very careful exegesis. However, it is the matter of Jonah’s aquatic experience in the belly of the fish and its significance as a Messianic sign that will occupy the rest of this particular study. This declaration is vital to understand properly for believers everywhere. It is the sign given to that generation which would prove Yeshua was indeed the promised Messiah. He employs the events of the book of Jonah to explain that He would also rise again after all hope was lost. His entombment in the earth would be for the precise same period of time as Jonah rode inside the fish on his way back to bring inevitable hope to the Assyrian people so trapped in their sins and idolatries. In the book of Jonah 1:17, we read of the time period that is very clearly given in the Hebrew text: three days and three nights! Messiah’s time in the tomb paralleled precisely that of the prophet in the confines of the fish. The three days and three nights are given in Matthew 12 as the sure sign of Yeshua’s Messiah-ship. The reality of this fact has implications for believers both Christian and Messianic: Messiah’s presence behind the stone covering the entrance of the tomb truly lasted for seventy-two hours: there seemed to be no hope for the one who carried the hope of good news. However, His rising from the tomb displayed to all who had eyes to see that He had been pulled from the jaws of death and held full authority to forgive the sins that would otherwise bring about our own destruction. The sign of Jonah was proved to be true: it was death, but it was also resurrection! There is another unique factor involved, however, that merits our attention. In the book of Matthew 16:4, we read of another situation where Yeshua speaks about the sign of Jonah being given to the undeserving generation. This particular incident echoes His former statement about a sign given to the people concerning the prophet Jonah. One noticeably absent detail from this second declaration is that of the time period of Jonah’s ride in the fish. In this instance, Messiah only references a “sign” of Jonah – He does not elaborate upon what that sign consists. Rather, He mentions it, and leaves the unique identity of that sign to the listener’s pondering. This was a different situation than the first time it is recorded, at a different locale, and to different people. Not everyone present would have also been there for the first time He mentioned the sign of Jonah being the time period of him being in the fish and linking that to His own coming death. Without that particular detail given – with just the mention of an obscure “sign of Jonah,” would the listeners at this second instance have been expected to immediately understand that the “sign” was the time frame of Jonah’s undersea adventure, having not been present for the first detail and without any context provided? With these intricate factors at play, could there possibly be a way for those who were present and heard only this second proclamation of a “sign of Jonah” to be able to discern the true intent of the “sign?” The Torah itself tells us that matters of judgment must be with two or three witnesses (see Deuteronomy 19:15). In this matter of Messiah’s righteous judgment against the evil and adulterous generation, the only proof given to them is the “sign of Jonah.” He openly declares it in Matthew 12, and then, in a slightly different way, He hints at it again, in Matthew 16. The judgment is repeated once more in Luke 11:29-30, but it is actually just a recounting of the same event recorded in the book of Matthew 12, so while it is a third witness in one way, it is actually part of the first witness. Either way, we find that Messiah gave the wicked and adulterous generation two definite witnesses that He would die and would be resurrected to life. 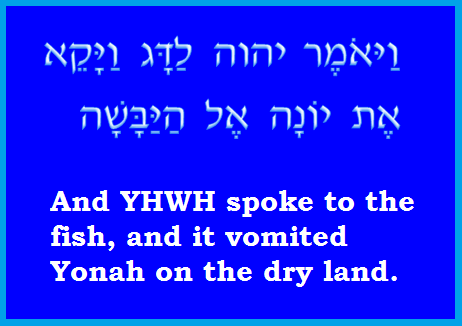 In this regards, there could actually be said to be two signs incorporated into the “sign” of Jonah – the first and obvious sign of the time frame of His death, and the second – a less blatant factor that He does not expound upon openly. 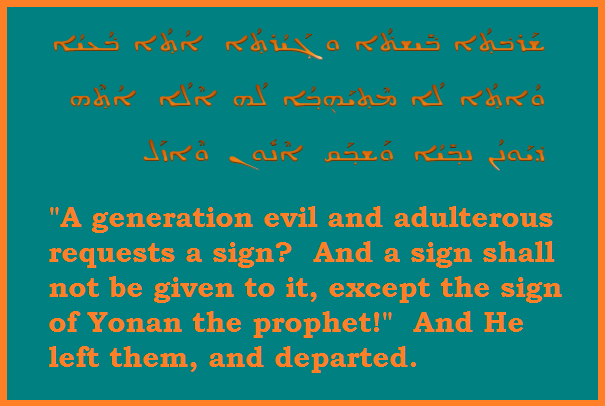 Therefore, we can conclude that some individuals who fell under the designation of an evil and adulterous generation got the sign with the time frame included, and some from that same generation got just the proclamation that there was a sign in the book of Jonah that was linked to the Messiah. 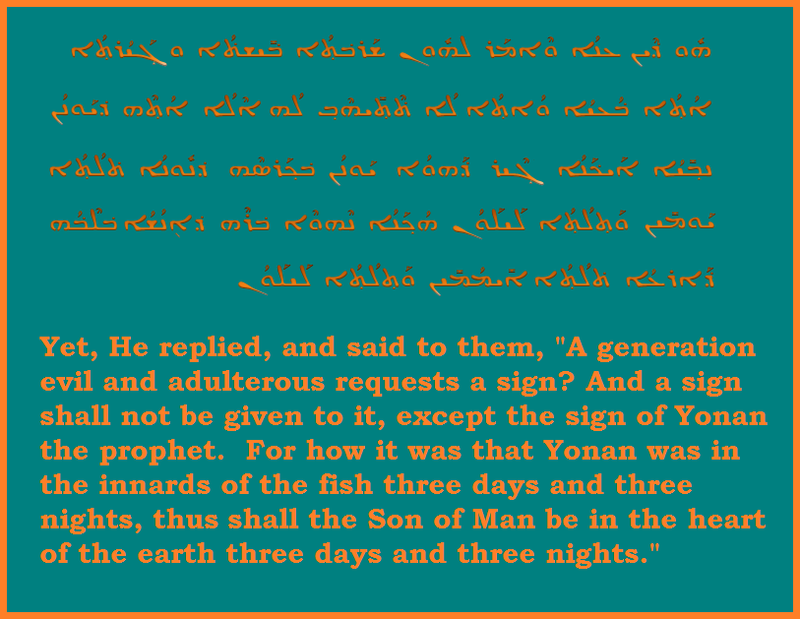 What, then, is the “sign” found in Jonah, if it is not immediately explained as the time period in which he rode in the fish? Let us look now at the book of Jonah and we will see that there is a very glaring and definite sign in the text that those who heard Messiah’s second declaration just might have discovered, if they pursued the matter further with diligent study of the Hebrew text of Jonah to search out that which He alluded in His words. Do you notice any particular detail here that might make you do a double-take? If you can read the Hebrew, you should immediately catch it. I have translated these verses literally, but have preserved the typical reading of the term for “fish” as it is popularly translated. The Hebrew alone gives the clue: there are two slightly different words for “fish” recorded here in the Hebrew text! 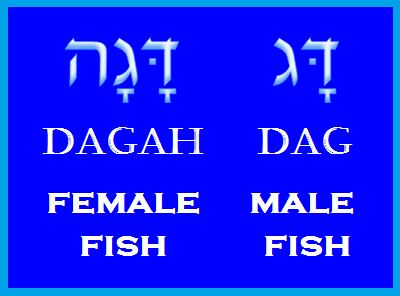 In the first verse, and in the last verse, the term for fish is DAG, which is essentially pronounced in English as “dog.” The middle verse, from Jonah 2:1, where he prays while inside the fish yields the surprise in Hebrew, for it reads DAGAH, which is the feminine form of “fish!” Literally, the Hebrew text should read that Jonah was swallowed by a male fish, was in the innards of the male fish for three days, then prayed to the Holy One from the innards of the female fish, and finally, was vomited out of the male fish onto dry ground. This is the literal Hebrew text inspired by the Spirit. Can you perceive a “sign” here in this weird detail? Is this not glaringly odd, when considered from the Hebrew? Only the Hebrew text has this nuance. Neither the Greek Septuagint, the Aramaic Peshitta AN”K, the Aramaic Targums, nor the Latin Vulgate preserves this unique reading! 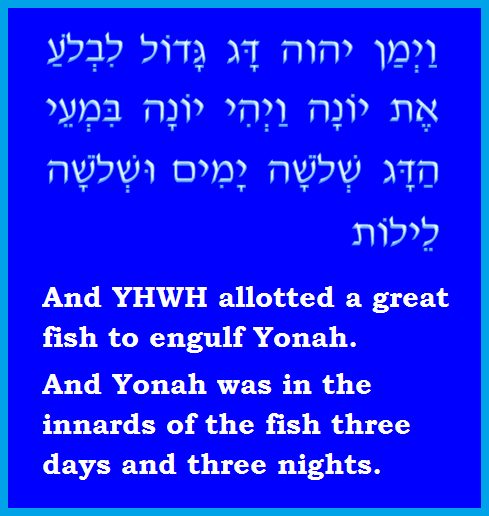 Only the inspired Hebrew text of Jonah possesses anything that could be potentially considered as a “sign” – and it just so happens to be found in the spot dealing with Jonah’s time inside the fish! This is no coincidence, but rather, proof that the small hint He gave in the second instance He spoke about a sign in the book of Jonah was indeed a valid clue that the astute reader just might catch! In fact, I have only ever seen a Jewish commentator reference this very odd detail of the Hebrew, and only in a brief address given to brush off the unique information as unimportant: the reality of this Hebraic detail in Judaism is explained away with the rather amusing explanation that Jonah was swallowed by a male fish, vomited underwater into the mouth of a female fish, and then vomited once more back into the mouth of the male fish. It is a wild assertion to make, to be sure, but that is the explanation given by Judaism. The final explanation of this gender difference is actually left to the reader to understand as they fit, but given the words of the Messiah of the sign of Jonah being related to the time spent inside the fish, and His secondary, less-clear declaration of a “sign” related to Jonah, then I must say that this very weird detail in the Hebrew should wisely be taken as something more significant than the explanation offered by those in Judaism. If their explanation is not viable, then what sort of explanation would be viable? I offer that the unique switch of gender in the Hebrew term DAG to DAGAH, and then back to DAG, is evidence of the Messiah in the tomb for a limited period of time. The same “sign” is essentially being proposed by the Messiah, but He actually gives two “signs” that form one, since He doesn’t elaborate on what the sign is during His second time of speaking about it. The listener present when He said that would have to dive into the text and “go fishing” for the sign! 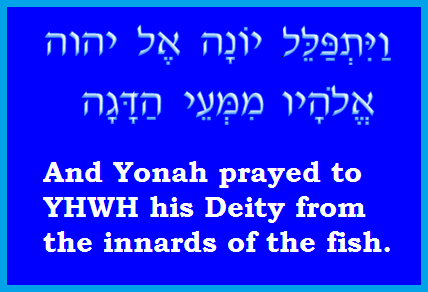 The Proto-Hebrew glyph is notable in that, as the letter HEH, with it being attached to DAG in Jonah 2:1, what is basically formed is a man associated with a fish, to which we are to “look here” and pay attention. 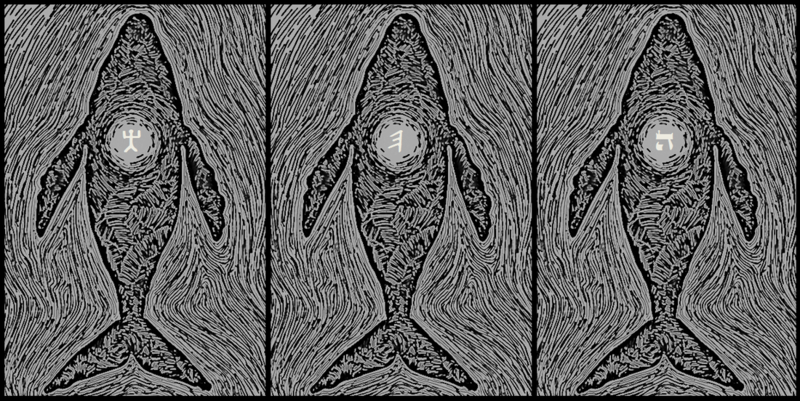 This aspect further aligns with the context of the content of Jonah’s prayer, contained in 2:2, where he compares being inside the fish to being in the belly of the grave, so that the resulting imagery is therefore a man (HEH) in the grave! This detail is then given further importance when we realized that the next time the fish is mentioned in 2:10, it is missing the HEH – the “man,” the “look here” factor. It is no more significant because the event is over – the man came and went from the body of the fish. When we understand the sign that is embedded in the Hebrew text of Jonah, we can appreciate all the more that the intent of the sign is a three day, three night period of time where the occupant is essentially doomed, and yet comes forth again, for all intents back from the dead! There is only one prophet in all of Scripture to whom Messiah compares Himself, and it is Jonah. But more pointedly, it is Jonah while in the innards of the fish for his three day, three night trip, which the prophet himself likened to being in the grave. Based on this association that the Messiah Himself made with Jonah, and the sign He personally pointed to as being significant, we cannot afford to symbolize or spiritualize the details of Jonah's experience in the fish - it is vitally important to read it with open eyes and see the sign for what it is. This time period thus formed the sign that Yeshua gave to that generation as proof of His identity as the legitimate Messiah for Israel. The signs of Jonah depict the resurrection of the Messiah for all who had and who have eyes to see and ears to hear!